As China prepares for its once-in-a-decade change of leadership, the Chinese people believe their country faces serious and growing challenges. In particular, the side effects of rapid economic growth, including the gap between rich and poor, rising prices, pollution, and the loss of traditional culture are major concerns, and there are also increasing worries about political corruption. While the Chinese have consistently rated their national and personal economic situations positively over the last few years, they are now grappling with the concerns of a modern, increasingly wealthy society. The Chinese public also increasingly expresses reservations about relations with the United States. Over the last two years, ratings for the U.S. and President Obama have declined significantly, and the percentage of Chinese who characterize their country’s relationship with the U.S. as one of cooperation has plummeted from 68% to 39%. Still, many Chinese embrace aspects of America’s soft power, including U.S. science and technology and American ideas about democracy. Inflation remains the top concern of the Chinese public – six-in-ten consider rising prices a very big problem. Meanwhile, half say corrupt officials are a major problem, up from 39% four years ago. Worries about consumer protection have also increased significantly. After a number of high-profile food safety scandals in recent years, concerns about the safety of food have more than tripled since 2008. Moreover, the rapid changes that have transformed their society in recent years have not been welcomed by all Chinese. Most still say they like the pace of modern life, but fewer hold this view today than four years ago. Nearly six-in-ten say their traditional way of life is getting lost and even more think their way of life should be protected against foreign influence. These are among the key findings from a survey of China conducted by the Pew Research Center’s Global Attitudes Project. Face-to-face interviews were conducted with 3,177 respondents between March 18 and April 15. The sample represents approximately 64% of the adult Chinese population.1 This poll in China is part of the broader 21-nation spring 2012 Pew Global Attitudes survey. While the global financial crisis has taken a serious toll in many nations over the last few years, most Chinese report continued economic progress – indeed, 70% say they are better off financially than they were five years ago. Among the 21 nations polled, Brazil is the only country where the public reports a comparable level of economic advancement. Additionally, a remarkable 92% of Chinese say their standard of living is better than their parents’ at a similar age. (For more on international economic mobility and other economic issues, see “Pervasive Gloom About the World Economy,” released July 12, 2012). Given this economic mobility and the overall success of economic reforms since the late 1970s, it is not too surprising that free markets are popular. Roughly three-in-four Chinese agree that most people are better off in a free market economy. However, there is a general consensus in China that the economic gains of recent years have not benefited everyone equally: 81% agree with the statement the “rich just get richer while the poor get poorer,” and 45% completely agree. 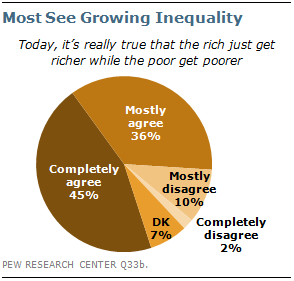 Roughly half (48%) say the gap between rich and poor is a very serious problem, up from 41% four years ago (fully 87% consider it at least a moderately big problem). In another sign that many do not see a level playing field in Chinese society, there are growing worries about corruption. Half now say corrupt officials are a very big problem, up 11 percentage points since 2008; and 32% say this about corrupt business people, also up 11 points from four years ago. Consumer protection is another rising concern. 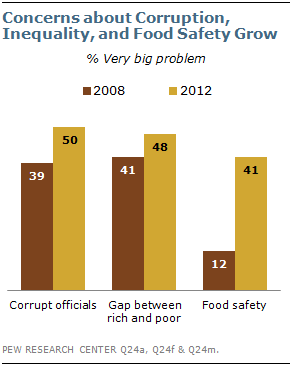 Four years ago, just 12% rated food safety a very big problem; today, it’s 41%. The percentage expressing very serious concerns about the safety of medicine has more than tripled, from 9% in 2008 to 28% today. And more now are very worried about the quality of manufactured goods (13% in 2008; 33% now). Increasingly, people are also anxious about having a social safety net. Since 2008, the percentage of those rating old age insurance a very big problem has more than doubled (from 13% to 28%), while the percentage who say the same about health care has jumped from 12% to 26%. The environment is also a serious concern to many. A third or more rate air (36%) and water pollution (33%) as very big problems. In addition, many Chinese are worried about the current state and direction of their culture and traditions. Most (57%) think their way of life is getting lost and 71% want to see their way of life protected from foreign influence. While 59% still say they like the pace of modern life, this is down from 71% four years ago. Wealthier Chinese are more likely to embrace modern life; 73% of those with higher incomes say they like it, compared with just 61% of middle and 54% of lower income Chinese. Growing Wariness of the U.S.
Over the last two years, Chinese views about their country’s relationship with the U.S. have shifted substantially. In 2010, roughly two-in-three described the U.S.-China relationship as one of cooperation; today, just 39% view it this way. Meanwhile, 26% now say the relationship is one of hostility, up from 8% in the 2010 poll. 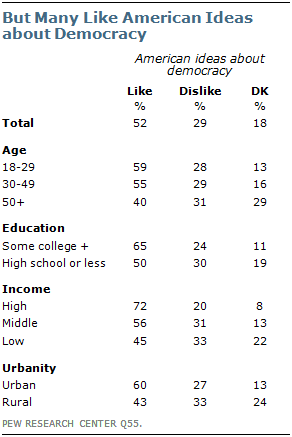 Similarly, while 58% had a positive view of the U.S. in 2010, only 43% do so today. President Obama’s ratings have also slipped – currently, 38% express confidence that he will do the right thing in world affairs, down from 52% two years ago. Nonetheless, many Chinese – especially younger, wealthier, well-educated, and urban Chinese – continue to embrace certain elements of American soft power. In particular, many admire the U.S. for its scientific and technological achievements. And in a country that remains a one-party state, American-style democracy has a strong appeal. Roughly half (52%) say they like American ideas about democracy; just 29% say they dislike these ideas. About seven-in-ten Chinese in the higher-income category have a positive opinion about American democratic ideals. Just like opinions regarding the U.S.-China relationship, views about the India-China relationship have cooled over the last two years. In 2010, 53% described relations between the two Asian powers as one of cooperation, compared with 39% now. Views on the Japan-China relationship are, on balance, negative. Just three-in-ten Chinese say their relationship with Japan is one of cooperation; fully 41% describe it in terms of hostility. Globally, perceptions of Chinese economic power have been on the rise since the onset of the financial crisis in 2008, and today many believe China is the world’s top economy. Across the 21 countries included in the spring 2012 Pew Global Attitudes survey, a median of 41% said China is the economic leader, while 37% named the U.S. (For more on international perceptions of China and the U.S., see “Global Opinion of Obama Slips, International Policies Faulted,” released June 13, 2012). The Chinese, however, do not believe they have ascended to the top spot. About half (48%) say the U.S. is the world’s leading economy, while just 29% believe it is China. Americans, meanwhile, are divided: 41% think China is the top global economy, while 40% believe the U.S. remains the leader.